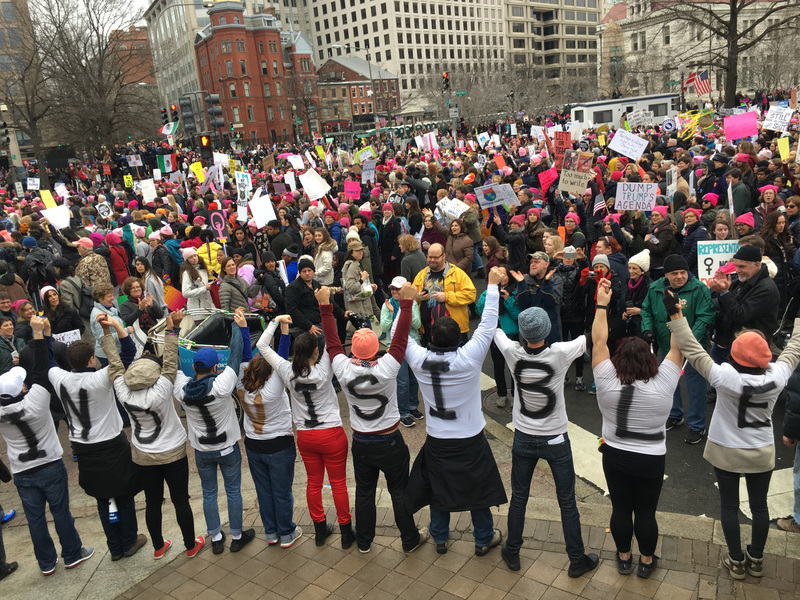 On Saturday, in hundreds of cities around the United States and the world, we marched together. We stood indivisible for inclusion and love, and we proved that the mandate is ours. And now, the work continues. Today, Monday, January 23rd: The Senate Foreign Relations Committeewill meet this afternoon to consider the nomination of Rex Tillerson for Secretary of State. As long-time CEO of ExxonMobil, Tillerson flouted U.S. foreign policy and befriended anti-democratic leaders like Russian President Vladimir Putin. Unsurprisingly he expressed skepticism about the dangers of climate change during his confirmation hearing. Tomorrow, Tuesday January 24th: The Senate Judiciary Committee will vote on Jeff Sessions, nominee for Attorney General. If confirmed, Sessions will be in charge of enforcing civil rights law and protections, despite having been rejected from a federal judgeship in 1986 after former colleagues testified about his history of racist remarks. Sessions has regularly opposed civil rights legislation and he has extreme anti-immigration views. Tomorrow, Tuesday, January 24th: Confirmation hearings continue for Rep. Tom Price to be Secretary of Health and Human Services. Rep. Price is a radical conservative who wants to destroy the Affordable Care Act, eviscerate anti-poverty efforts, and undermine women’s health, reproductive rights, and LGBTQ rights. There are also unanswered ethical questions about profits Price has made trading health care stocks during his time in Congress where he worked on health care legislation. DELAYED! Trump’s controversial and unqualified nominee to be Secretary of Education, millionaire Betsy DeVos, was supposed to get a vote on Tuesday, the 24th. But in the wake of her poor performance in Congress last week and release of a report on her ethical conflicts, Committee Chairman Grassley has delayed that vote until January 31st. Let’s delay this permanently! Urge your Senators to oppose the confirmation of Betsy DeVos for Education Secretary. 2) Tell Your Representative, “Vote No on HR 7, Yes for Women’s Healthcare”: You would think, in the wake of Saturday’s monumental Women’s March that Congress might show some reContact Your Elected Officialspect for women’s rights. You’d be wrong. Instead, on Tuesday, January 24th, the House has scheduled a vote onHR 7. This unnecessary and intrusive legislation meddles with the private insurance marketplace and attacks women’s reproductive rights. It’s not the first time Republicans have tried to pass this anti-woman bill. 3) Keep the Pressure On: Tell Congress to #ProtectOurCare. One of President Trump’s first acts in office was to sign an Executive Order that could threaten essential components of the Affordable Care Act. But to dismantle the ACA, Trump will need to get repeal legislation through Congress. 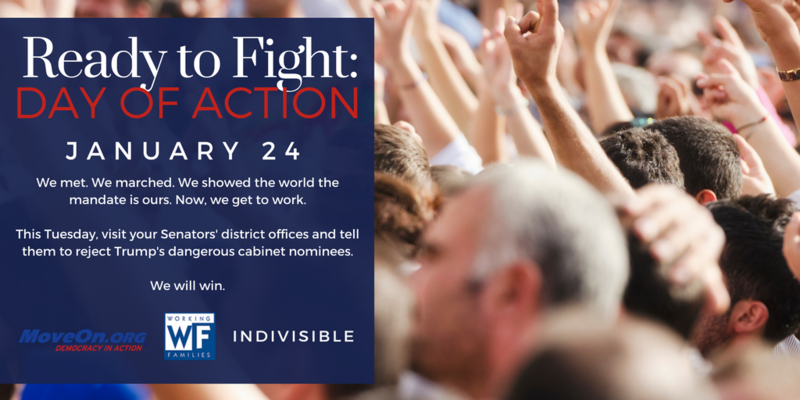 Keep the pressure on your members of Congress! Tell your Representative and two Senators that you won’t stand by and let 30+ million people lose their healthcare — and that you expect that they won’t either.